Congenital cholesteatoma has been reported to be present in 4-7% of cases of congenital External auditory canal atresia. Congenital cholesteatoma may originate from an epidermoid formation in the anterior superior lateral tympanic cavity adjacent to the anterior annulus during fetal development. CT scan, especially, high-resolution CT scan is of great importance to delineate the extent of disease process and also to know the ossicular-chain status, condition of inner ear, and condition of seventh and eighth nerves. CT scan in case of congenital aural atresia also helps prognostically to predict the outcome of surgical correction. A 30-year-old female patient presented with mastoid fistula with discharge on and off for the last 20-25 years along with history of deafness. She had atresia of left external ear canal since birth. There was no h/o trauma. On examination, pinna was normal in size and shape. Atresia of left ear canal was present (both bony and cartilaginous). A fistula was present near the tip of mastoid. Tuning fork tests showed conductive hearing loss in left ear. Vestibular function tests were normal. Pure tone audiometry showed 50 dB conductive hearing loss with opposite ear normal hearing. CT scan showed absence of bony and cartilaginous external auditory canal and presence of cholesteatoma filling whole of middle ear cavity extending to mastoid. No ossicle was seen [Figure 1]. Under General anaesthesia, mastoidectomy was carried out, cholesteatoma was removed and no ossicle was seen. The mastoid fistula was repaired and meatoplasty was carried out and the post-operative period was uneventful and the patient reported subjective improvement in hearing. A 24-year-old male presented with c/o discharge from the left ear since childhood and he had been scanty and continuous with no relief on repeated medication. The patient was a case of Down syndrome. There was a minute hole in the atretic left EAC from where foul smelling discharge was coming out. Chronic suppurative otitis media was present in the right ear too which was dry at the time of presentation. There was bony and cartilagenous canal atresia on left side. On CT, there was a cholesteatoma mass seen in the middle-ear cavity and no ossicle was present [Figure 2]. Case was taken up under GA for mastoidectomy. Keeping in view that in such cases where no typical surgical landmarks are present and to avoid injury to the vital structures, the drilling was started from the small hole after giving post-auricular incision. The mastoid cavity was widened and the bony meatoplasty was carried out and the post-operative period was found to be uneventful. A 35-year-old male with microtia both ears presented with discharge from left side through a small hole in the skin in the region of EAC. On examination, no external auditory canal was visible. Discharge was foul smelling and there was s/o left facial nerve paresis. Pure tone audiometry showed 55 dB of conductive hearing loss in the left ear. 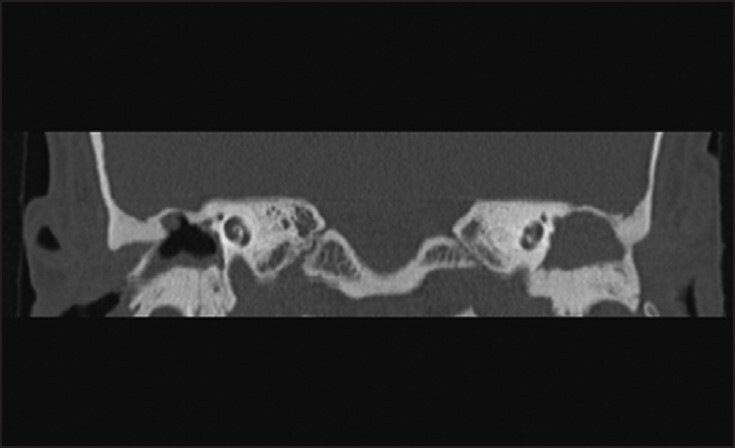 High resolution computed tomography left temporal bone showed bony and cartilagenous atresia of both ears. Cholesteatoma mass seen in the left ear cavity and there was no significant complaint in the right ear except mild hearing loss. Case was taken up under GA. In this case, we faced some problem as pinna was not properly developed. The tragus was visualized and endaural type incision was given. 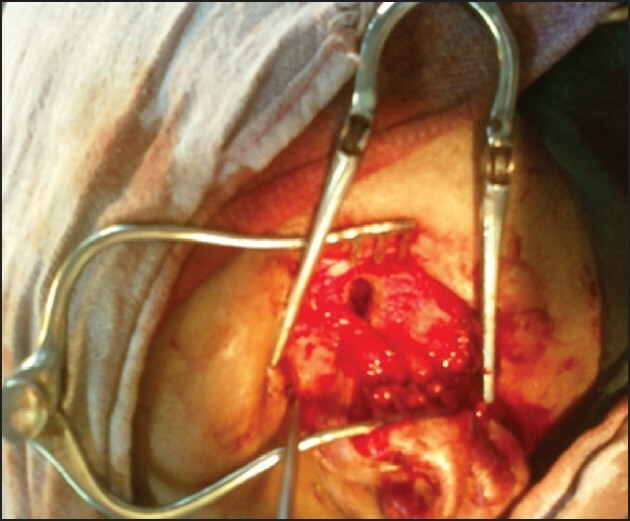 A small hole in the bone [Figure 3] was identified from where the drilling was started and mastoidectomy with bony meatoplasty was carried out. No ossicle was seen and the post-operative period was uneventful with persistence of the left facial nerve paresis. The histopathological examination in all the three cases was suggestive of cholesteatoma. Disorders of pinna and external auditory canal are common entity in clinical otology. Cholesteatoma is rarely a primary lesion (congenital cholesteatoma), originating from epithelial rests of ectodermal origin in the petrous bone, which may spread in and around the labyrinth and extend into the middle-ear cleft. Congenital cholesteatoma may arise from cerebellopontine angle, petrous pyramid, jugular fossa, middle-ear cavity and mastoid antrum. Acquired and congenital cholesteatoma are identical in their histopathological nature. They are keratin filled, epithelium-lined cysts that demonstrate linear growth pattern like skin. Presence of otitis media is the only differentiating feature between acquired and congenital cholesteatoma. Congenital cholesteatoma is usually silent but presents with complications such as otitis media, facial paralysis, hearing loss. Usually, the cause of infection is pseudomonas aeruginosa, bacillus proteus travelling along the Eustachian tube More Details. The diagnosis requires high-index of suspicion, knowledge of the sign and, symptoms produced by an expanding mass in the mastoid region and imaging study of this region. Clinical presentation depends on the site of lesion. If it is present in the middle ear cavity, it will manifest as deafness in early childhood; alternatively, if it is in petrous apex, patient will present with facial spasm in adulthood. Imaging plays a major role in diagnosing and delineating the extent of the disease and planning for the surgery. CT scan also plays pivotal role in planning the surgery and grading the outcome of the surgery in congenital aural atresia. A grading system based on pre-operative HRCT of the temporal bones was developed in an effort to select cases with chances of better outcome following atresia surgery. Pneumatisation of mastoid and presence of stapes have been the most important criteria for atresia surgery. The cholesteatoma removal is preferred over prior reconstruction of hearing or canal reconstruction. 1. Jahrsdoerfer RA. Congenital atresia of the ear. Laryngoscope 1978;88:1-48. 2. Sadler TW. Langman's Medical Embryology. 7 th ed. Baltimore: Williams and Wilkins; 1995:77. 3. Latack JT, Kartush JM, Kemink JL, Graham MD, Knake JE. 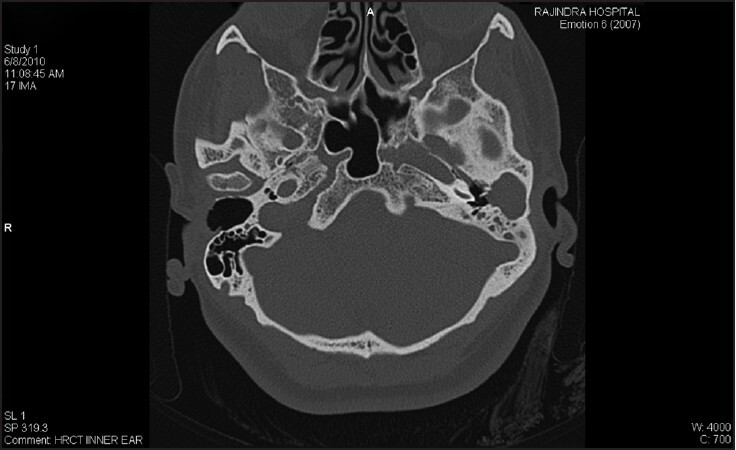 Epidermoidomas of the cerebellopontine angle and temporal bone: CT and MR aspects. Radiology 1985;157:361-6. 4. Griffin C, DeLaPaz R, Enzmann D. MR and CT correlation of cholesterol cysts of the petrous bone. AJNR Am J Neuroradiol 1987;8:825-9. 5. Ghosh A, Saha S, Sadhu A, Saha PV. Imaging of congenital cholesteatoma with atretic ear: A rare case report. Indian J Radiol Imaging 2006;16:673-5.